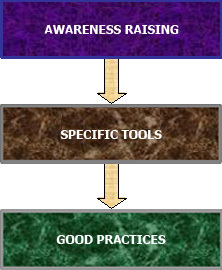 Capacity building is one of the core competencies of FMSF. Over the past 15 years, the capacity building initiative has undergone changes. The capacity building initiative, initially was only restricted to training on EED requirements to the partner network and eventually shifted to the broader areas of financial management, governance and social accountability issues. The shift has been from an 'awareness raising' mode to 'specific tools' followed by 'Good practices'. At present, FMSF is focusing on capacity building through "specific sustained courses".